Working with dates in Tableau differs depending on whether you are using a Relational or Multidimensional Data Source. This section below discusses these differences. 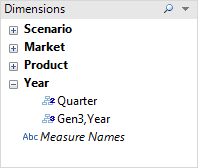 For multidimensional data sources, dates dimensions are usually organized into hierarchies that contain levels such as year, quarter, and month. In addition, some multidimensional data sources have time intelligence enabled, which makes it possible to look at data levels different ways, such as Months by Year, Months by Quarter, Weekends, etc. These levels are represented as attributes of the hierarchy. Hierarchies and attributes are defined when the cube is created and you cannot modify them in Tableau. For example, the Year dimension from an Oracle Essbase data source is shown below. For relational data sources, dates and times are automatically placed in the Dimensions area of the Data window and are identified by the date or date-time icon. For example, the Order Date and Ship Date dimensions from an Excel data source are shown below. If you don’t want Tableau to automatically select a date level and would rather have a date dimension be a continuous field, you can right-click the field in the Data window and select Convert to Continuous. The dimension then turns green in the Data window; now when you use that dimension in a view, it will be continuous. You can easily revert back by selecting Convert to Discrete from the field’s context menu in the Data window. You can also convert a field in the view to continuous while it is on a shelf by selecting Continuous on its context menu (which you can see when you right-click the field). The field on the shelf turns green but the field in the Data window is still discrete.